Dr. Meyer will study the exams and x-rays from your first visit and meet with you to discuss the results. If chiropractic is likely to help your condition, he will recommend an appropriate treatment program. 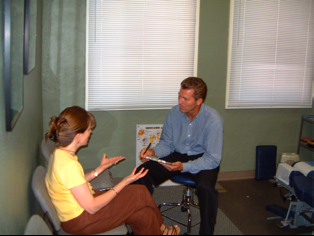 After you have an understanding of your condition, you are ready to begin Chiropractic Manipulative Therapy (CMT) or adjustments and/or other physiotherapy modalities. A specific force in a precise direction applied to a fixated joint, which will return bones to a more normal position and motion. This is usually done by hand or occasionally a small instrument is used. Our office is equipped with a state of the art adjusting table that has features to aid in the adjustment. 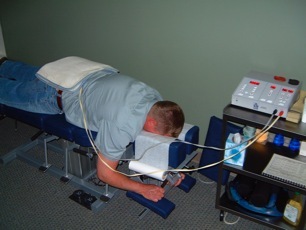 A machine administers an electric current that is used on soft tissue injuries. This small amount of current causes a slight tingling sensation and reduces pain, swelling and muscle spasm. Traction can be administered by lying on a our intersegmental traction table. This passive gentle rolling action is comfortable, increases mobility, restores elasticity and improves circulation of spinal fluids. Warm, moist heat packs applied to the surface of the skin relieve pain, relax muscles and are sometimes helpful before a chiropractic adjustment. They are especially helpful in cases of chronic pain and muscle tightness. Frozen gel packs are used to numb painful areas and help relax muscle spasms. These cold compresses are used for acute injuries or flare-ups of chronic conditions. Initially for acute injuries, ice should be applied several times per day and home icing instructions may be given.